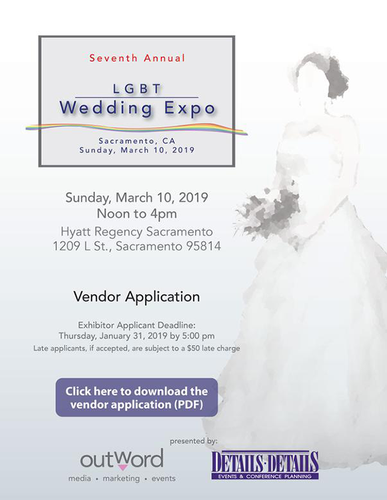 Join Sacramento Rainbow Chamber at the 7th annual Sacramento LGBT Wedding Expo! Whether you're planning your Big Gay Wedding, or just want to celebrate community, diversity and equality, this free LGBT Wedding Expo is fun for everyone! The Sacramento Rainbow Chamber of Commerce will once more sponsor the Sacramento LGBT Wedding Expo! Celebrate equality & take advantage of this great opportunity to introduce your business or service to the LGBT marketplace! Members of Sacramento Rainbow Chamber of Commerce receive a $25 discount on Expo exhibit space. Click HERE to unload the Vendor Application! For information about being a Wedding Expo exhibitor or sponsor, visit http://www.saclgbtweddingexpo.com!